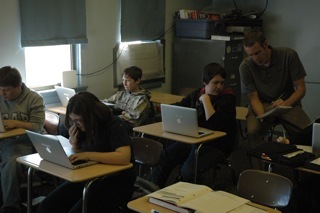 Mr. Jackson Krejci's Math 7 students work on their IXL math program which they work on once a week on their personal computers. The students are currently working on multiplying and dividing mixed numbers. Pictured are: Johnathon Mounce, Hunter Worrell, Brianna Beatham and Jaret Clift.